What’s Ahead for Apple in 2019? Back in 1985, Steve Jobs was ousted from Apple. The company would still benefit from a few years of continuing growth until it hit a roadblock and sales started to fall. By 1996 Apple brought in a new CEO which was supposed to turn it over. But by 1997 things didn’t get better until Apple recalled Steve Jobs after acquiring its company NeXT. Steve Jobs came back, and in a few years it turned Apple over and made it become a tech giant again. 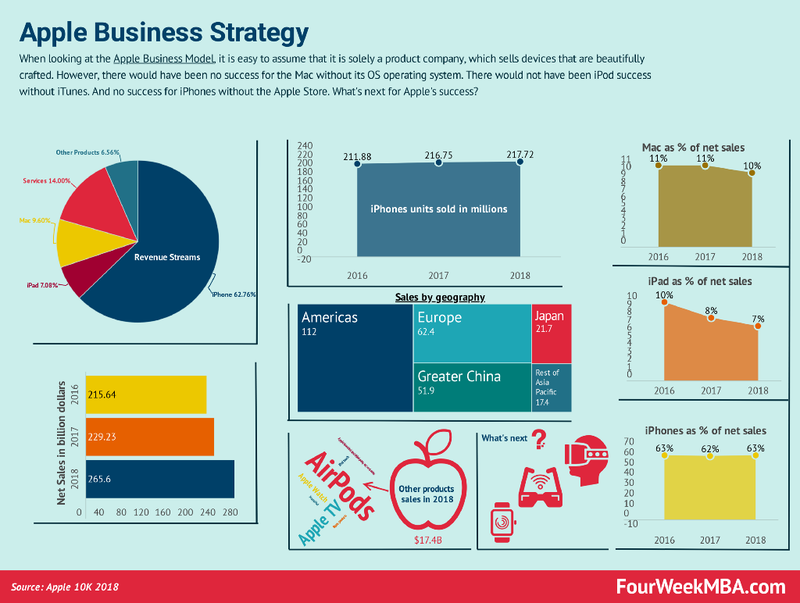 As of 2018, iPhones represented about 63% of the company’s net revenues. However, Apple is way more than that. The Mac and its following products without its OS operating system would not have been that successful. One of the mistakes we all make when looking at a company’s success is to think that a single tactic or product determined its success. However, it’s never that simple. In many cases, a combination of technology, product, and business modeling make it possible. April 28:Apple releases the third-generation iPod, which moves the control buttons to a new row of touch-sensitive buttons under the screen. This model introduces the USB dock connector for syncing. Apple also introduces iTunes Music Store, which opens with 200,000 songs available for 99 cents each. At a time when music piracy is rampant, the move is seen as ballsy. Who would pay for music when it is available for free? But Jobs argued that simplicity and ease of use would trump stealing. Most consumers wanted to do the right thing, he said. In short, Steve Jobs bet on a new way of consuming music, which implied a whole new business model. Where Music needed to be purchased and consumed on CD, with entire albums, Apple made it possible to buy any song for just 99 cents, and you didn’t need to buy the whole album. This new business model for music allowed the iPod to take off (there were also critical aesthetic changes to the product itself). 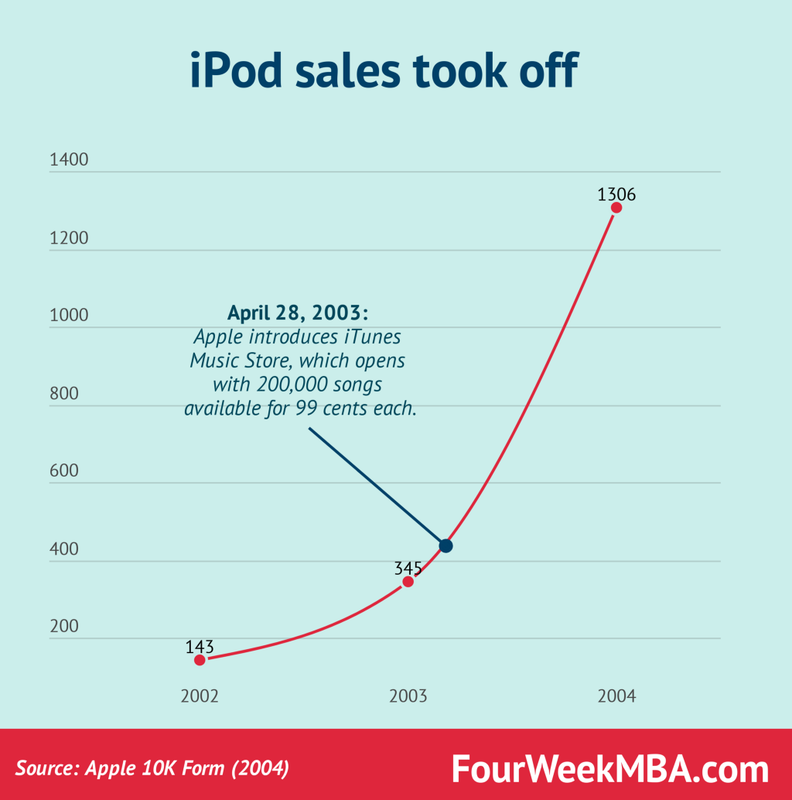 By 2007, the iPod would bring to Apple over eight billion dollars in annual revenues! In 2007 Apple launched the iPhone. It was a revolution in the way it conceived phones. More than a phone it was like having a mini-computer in the pocket. 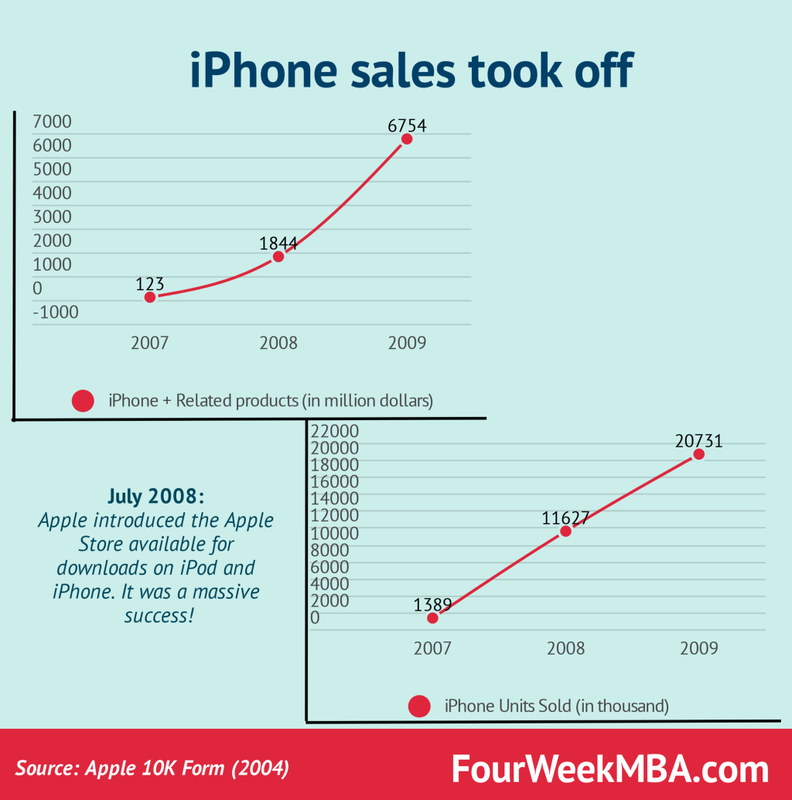 It isn’t like the iPhone itself was what made Apple sales take off. Instead, once the Apple Store came out, that is when the iPhone came as a massive success! CUPERTINO, California — July 14, 2008 — Apple® today announced that iPhone™ and iPod® touch users have already downloaded more than 10 million applications from its groundbreaking new App Store since its launch late last week. Developers have created a wide array of innovative mobile applications ranging from games to location-based social networking to medical applications to enterprise productivity tools. Users can wirelessly download applications directly onto their iPhone or iPod touch* and start using them immediately. More than 800 native applications are now available on the App Store, with more than 200 offered for free and more than 90 percent priced at less than $10. Once again, technology + beautifully crafted product + business model innovation = massive success. Once again Steve Jobs and Apple changed the rules of the game. They created a platform where developers could monetize their expertise and put applications in the hands of mass consumers. Apple also played smart and changed the rule of the game in terms of carrier agreements. Distribution is always a critical ingredient for any company’s success toward scalability. Therefore, rather than just creating a cool product, Apple created an ecosystem made of several key players. Let’s start with the current numbers. 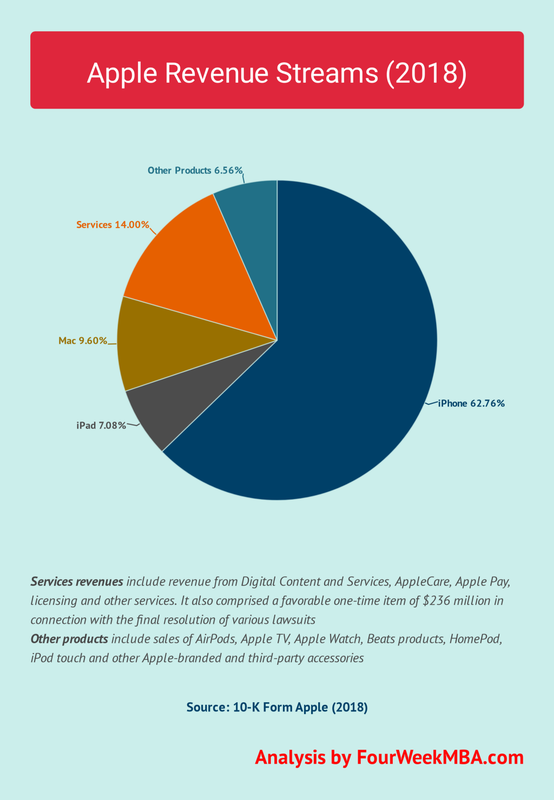 The iPad, Mac, and iPhone represent most of the company revenue. In 2018 84% of Apple net sales came from those products. The remaining part went toward service and other products. The iTunes Store, available for iOS devices, Mac and Windows personal computers and Apple TV, allows customers to purchase and download or stream music and TV shows, rent or purchase movies and download free podcasts. The App Store, available for iOS devices, allows customers to discover and download apps and purchase in-app content. The Mac App Store, available for Mac computers, allows customers to discover, download and install Mac applications. The TV App Store allows customers access to apps and games specifically for Apple TV. The Book Store, available for iOS devices and Mac computers, features ebooks from major and independent publishers. Apple Music offers users a curated listening experience with on-demand radio stations that evolve based on a user’s play or download activity and a subscription-based internet streaming service that also provides unlimited access to the Apple Music library. The cloud service which stores music, photos, contacts, calendars, mail, documents and more, keeping them up-to-date and available across multiple iOS devices, Mac and Windows personal computers and Apple TV. Assistance that is built into software products, electronic product manuals, online support including comprehensive product information as well as technical assistance. Cashless payment service that offers an easy, secure and private way to pay. This service side of the business has been critical to allowing Apple products sales to take off. Other products: the SmartSpeaker battle? Not an easy one! As of 2018 the other products only represented 6.5% of Apple’s revenues. Yet what if the next gem is right there? By following the pattern of how Apple products have been evolving, among the potentially successful products, the HomePod powered by Siri seems to be the most promising. Thus SiriKit might be the attempt of Apple to build the same ecosystem it managed to create in the past for the OS, and App Store. Yet the playground for voice is a hard one, made of competitors like Google (Google Home) and Amazon (Alexa). The SmartSpeaker battle is still on, and Apple didn’t seem to have found its homerun yet. Of course, it’s too early to say who’ll win the battle. But what if the next thing is around the corner? What’s next for Apple? Apple’s iGlasses? As reported by TechCrunch, in 2017, Apple bought Vrvana, a startup from Montreal, Canada, maker of the Totem headset, for around $30 million. The purchase of Vrvana is not an isolated case. As Apple also might have acquired a year before SensoMotoric Instruments (SMI), an eye-tracking firm, as reported by TechCrunch. Other acquisitions in the previous years comprised Flyby Media, Metaio, Emotient and Faceshift. Are the Apple Smart Glasses an option? Originally published at fourweekmba.com on December 28, 2018. What’s Next For Apple? was originally published in Hacker Noon on Medium, where people are continuing the conversation by highlighting and responding to this story.